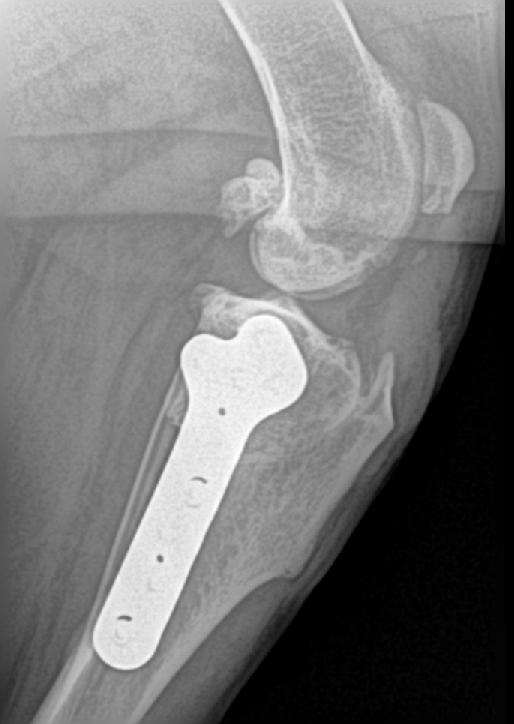 Anterior or Cranial Cruciate ligament rupture is one of the most common orthopedic injuries that veterinarians see dogs. There are many repair techniques available to repair this injury. Dr. Hodges repairs Cranial Cruciate tears with several techniques. Leveling osteotomies are usually the best surgery for this injury. The TPLO (Tibial Plateau Leveling Osteotomy) or CBLO (Cora Based Levelingl Osteotomy) are considered the best surgeries to utilize for the correction of the steep angles of the tibial plateau, that is considered the primary reason the Cranial Cruciate Ligament tears. At Coulter Animal Hospital, we prefer to utilize the CBLO procedure. The CBLO or CORA technique ( center of rotation of angulation ) has several advantages over the other cruciate repair surgeries. We also utilize the Arthrex systems called SwiveLock or FASTak. This system uses a proven technique that has superior strength to other external suture techniques. CBLO (Cora Based Levelingl Osteotomy) CBLO surgery involves making a curved cut in the tibia from the front to the back, much like the top half of a smiley face. The top section of the tibia is then rotated forward until the angle between the tibia and femur is deemed “appropriately level,” typically between 2 and 14 degrees. 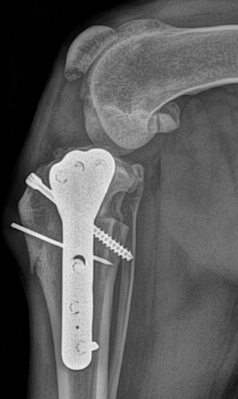 A metal bone plate and diagonal compression screw are then used to affix the two sections of tibia in the desired positions, allowing the tibia to heal in its new configuration. TPLO (Tibial Plateau Leveling Osteotomy) TPLO surgery involves making a curved cut in the tibia from the back to the front , much like the bottom half of a smiley face. The top section of the tibia is then rotated backward until the angle between the tibia and femur is deemed “appropriately level,” typically around 5 to 8 degrees. 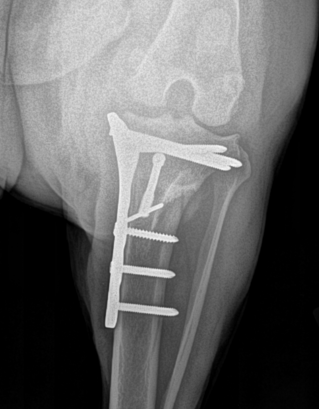 A metal bone plate is then used to affix the two sections of tibia in the desired positions, allowing the tibia to heal in its new configuration. This surgery creates a balcony effect, since the top of the tibia is centered over the back of the shaft of the tibia.